We have reached a pivotal moment for fishing, with seventy-five percent of the world’s fish stocks either fully exploited or overfished. If nothing is done to stop the squandering of fish stocks the life of the oceans will face collapse and millions of people could starve. Fish is the aspirational food for Western society, the healthy, weight-conscious choice, but those who eat and celebrate fish often ignore the fact that the fishing industry, although as technologically advanced as space travel, has an attitude to conservation 10,000 years out of date. Trawling on an industrial scale in the North Sea takes 16 lbs of dead marine animals to produce just 1lb of sole. Regulation isn’t working, fishermen must cheat or lose money, dolphins and other wildlife (seabirds, turtles, sharks) are killed unnecessarily and fish stocks are collapsing despite the warnings. 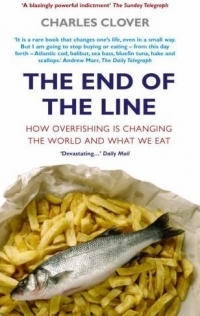 The End of the Line looks at the problem and proves that we, as consumers, have to change if the situation is to improve. The End of the Line has now been made into the world’s first major documentary about the devastating effect of overfishing, and premiered at Sundance Film Festival in January 2009. The UK release was sponsored by Waitrose and coincided with World Oceans Day on 8th June 2009. Those supporting the film include Greenpeace, WWF, Stephen Fry and Gretta Scacchi. Persuasive and desperately disturbing, this book is the marine equivalent of Silent Spring. It is a rare book that changes one's life, even in a small way. Anyone who loves to eat fish will be fascinated, appalled and challenged by this book.